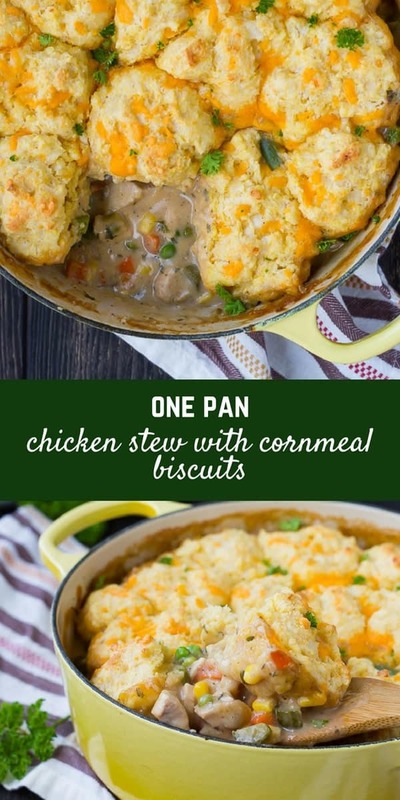 Cozy and comforting, this one pan Chicken Stew with Cornmeal Biscuits is easy to make and even easier to eat! Your whole family will love this new take on a classic. So, today is day 7 of Whole 30. I told one of my friends that I wasn’t going to share about this here because I didn’t want to be held too accountable, but you guys also know I have a big mouth and can’t resist sharing everything. Go ahead and hold me accountable. I’ve got my mind set on this. I want to prove to myself I can do it, no matter how hard it is. Some people fight cancer or experience homelessness or HURRICANES. I can surely survive without carbs and sugar for 30 days, right? I’ll obviously be back to eating all the things soon (you can read more here about why I’m doing Whole 30). In the meantime, if you’re in need of some comfort, this chicken stew is for you. The fact that you can make it in one pan is comforting in and of itself, am I right? 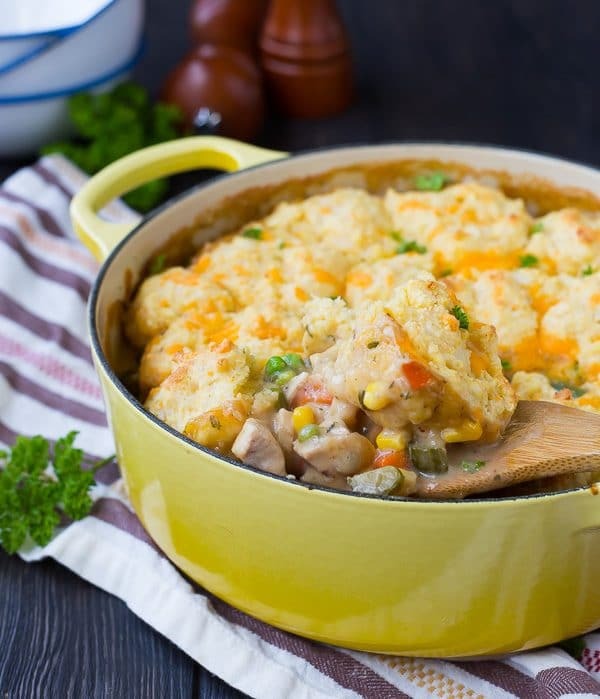 The chicken stew base of this recipe is creamy, comforting and similar to a classic pot pie. The topping is based off my whole wheat cornmeal biscuits, except these aren’t whole wheat. I’m living on the edge over here. Also, I opted for a rustic, homestyle look by making them drop biscuits instead of rolled out and cut biscuits. I have lots of tips for you in the notes of the recipe — make sure to check them out before you get cooking. It will make your life easier, trust me! Homemade Hamburger Helper – Healthy! Stir together flour, cornmeal, sugar, baking powder, and salt until combined. Cut in butter using a fork, pastry cutter, or your fingers, until it resembles coarse crumbs. Stir in cheese and buttermilk until just combined. 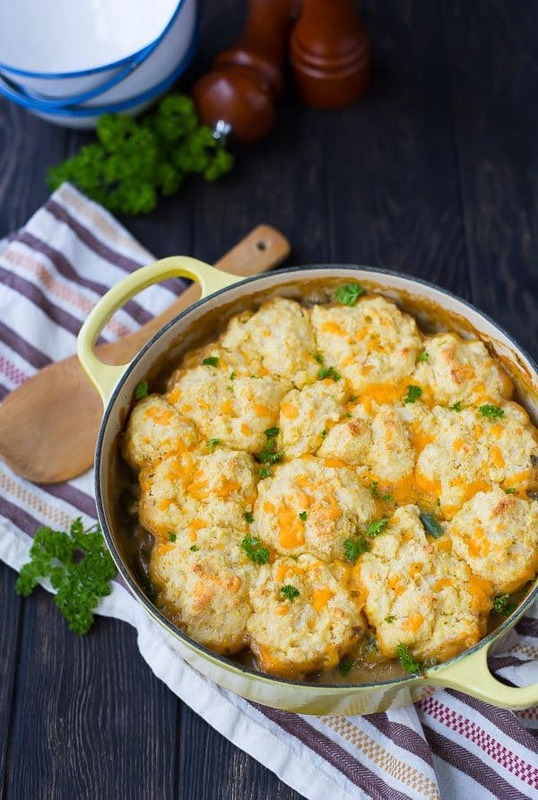 Place bowl of biscuit dough in fridge while you make the rest of the stew. 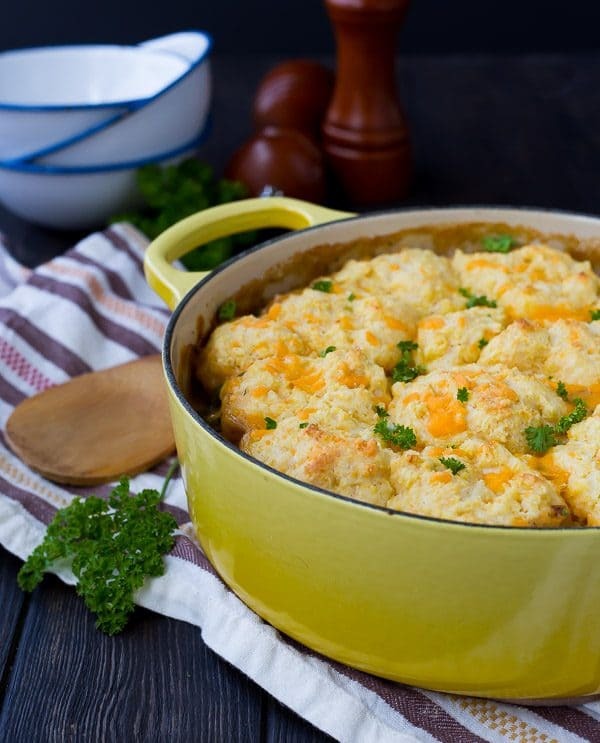 In a large oven-safe dutch oven or deep skillet, heat 1 tablespoon olive oil over medium heat. Add chicken and cook until golden brown and cooked through. Remove to a plate. Add onions and celery to hot pan (add a small amount of olive oil if needed) and cook, stirring, until translucent and softened. Add butter and flour and cook until butter is melted. Stir in milk and broth slowly while stirring, and continue to cook until simmering and thickened, about 8 minutes. Add in parsley, thyme, salt, pepper, celery seed, frozen vegetables, and chicken, and cook until mixture begins to simmer again. 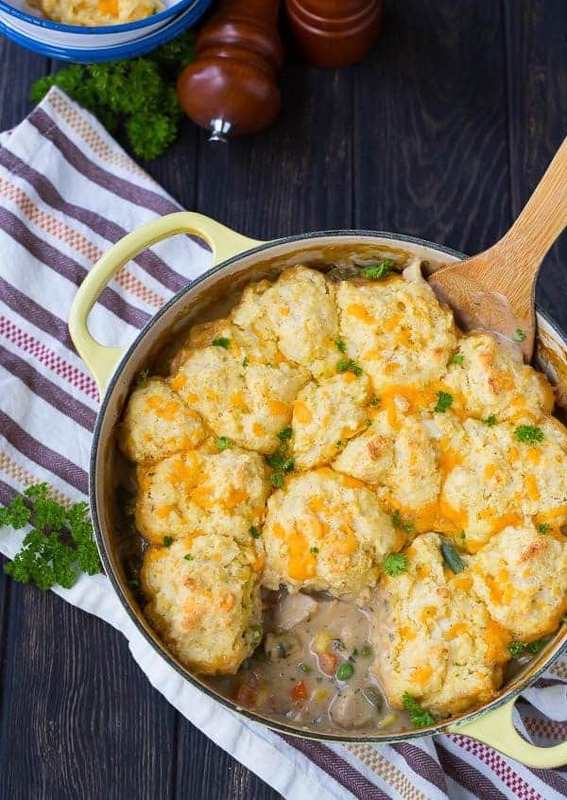 Drop biscuit dough onto stew using a spoon or your hands in about 1/3 cup portions. Transfer to oven and bake for 20-22 minutes or until bubbling around edges and biscuits are golden brown. Note: If you don’t have buttermilk, you can mix 1 tablespoon vinegar or lemon juice + enough milk to make 1 cup – let sit for 5 minutes, and you’re ready to go! Note: If your pan is big enough, this recipe will accommodate another 1/2 pound of chicken. 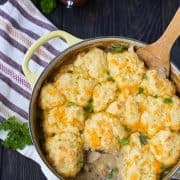 Note: If you don’t have a large enough oven-safe pan, you can prep the chicken stew and then pour it into a 9×13 baking dish before topping with biscuit dough and baking. Verdict: Such a comforting meal! We love this one. Husband’s take: Ben is obsessed with this — he definitely had seconds, and leftovers. Changes I would make: None are necessary! See my recipe notes for some ideas. Disclosure: I have been compensated by Milk Means More for my time to develop this chicken stew recipe and write this post. All opinions are as always, my own. Find out more about why Milk Means More on Twitter, Facebook, YouTube, Instagram and Pinterest.